These little protein-filled balls of Thai chicken yumminess make an awesome addition to a big crunchy bowl of veggies. Meatballs are a great way to cook up a batch of protein that is flavorful, full of veggies, and easy to portion out for the week. Thai chicken meatballs are on my rotation list when I am doing weekly food prep. They have so much flavor, and taste delicious both warm and right out of the fridge. This recipe is also grain-free and gluten-free as long as you use tamari or coconut aminos. Here’s what I normally throw together for my beast bowl (my version of a Buddha bowl): lettuce, fresh tomatoes, shredded carrots, cabbage, and some Asian cucumber salad. The dressing on the cucumber salad adds it’s flavor to the whole bowl. If you don’t already have cucumber salad made, you can use the sauce from the meatball recipe to add to this bowl. Vermicelli rice noodles can be another great addition if you want a few more carbs. 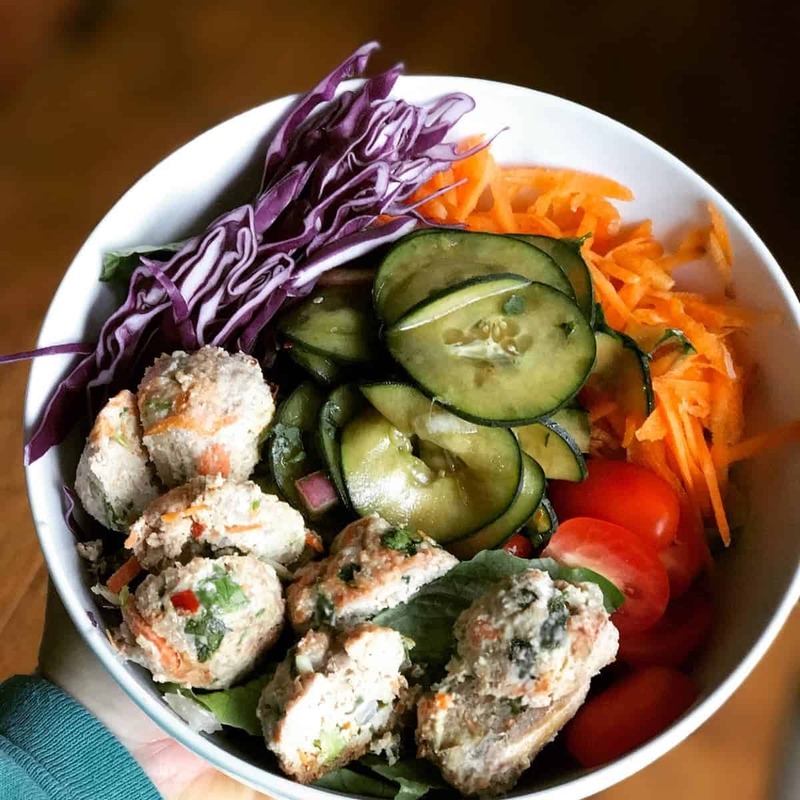 These are tasty protein packed ball of deliciousness that can be eaten alone or tossed on top of the Thai Chicken Meatball Beast Bowl. Make meatballs, using a 2 tbsp size scoop. Add a few tablespoons to your bowl. Fill a large bowl with your choice of fixings. Add the right amount of meatballs for you. I like 3-4. Add a few tablespoons of sauce.